Here is a smaller version of a winter landscape I did a couple years ago (see my Dec. 3, 2015 post), done in a slightly less elongated format than the original, and with a somewhat different design. 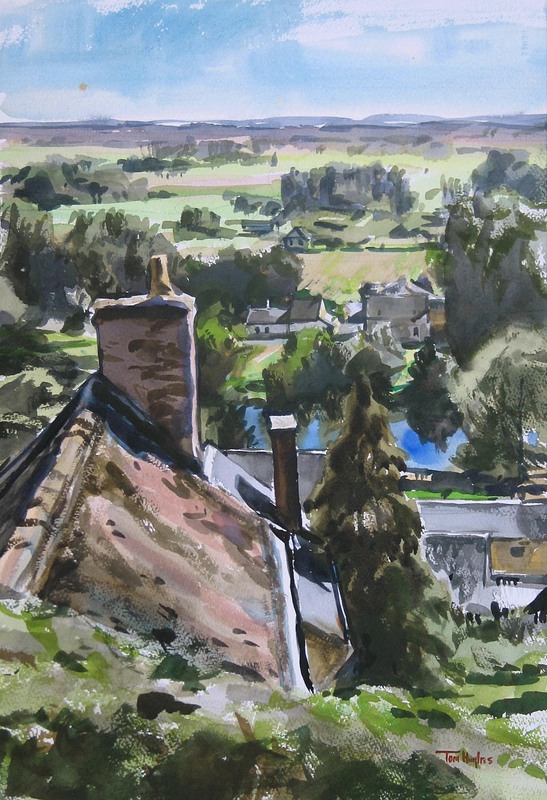 Here's a look from the hillside of Trôo out over the Loir River toward St.-Jacques. Or it's a painting of a chimney. 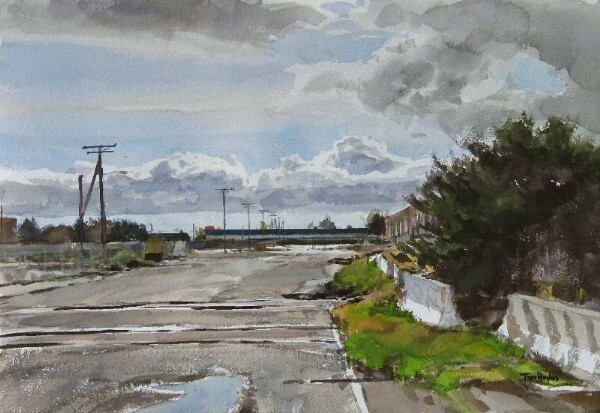 Check it out: in 2004, I painted a watercolor from the same spot, same month, same time of day. 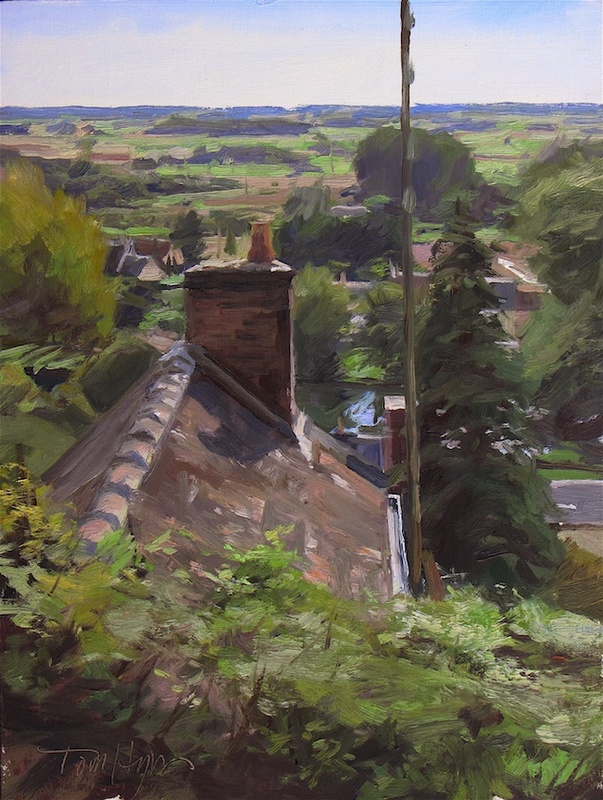 Next day, no painting; I caught a ride from a friendly neighbor who was going to Tours, where was the closest place I could buy brushes: I'd forgotten to leave any brushes in France and had had to borrow a fistful of them from another local friend to paint the chimney pic. They worked out ok, but I need my own brushes. 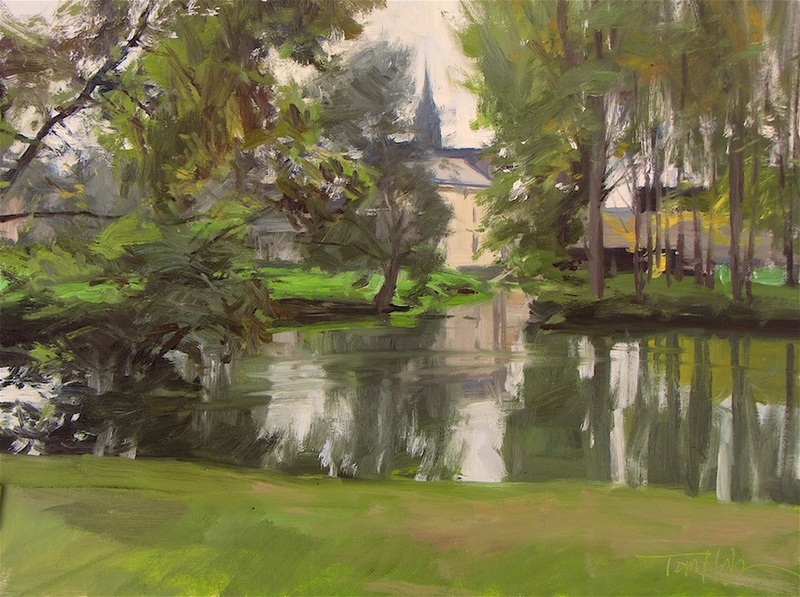 Next day I went across the Rue Bas (actually Rue Auguste Arnault) at the base of Trôo, and looked out over the Loir toward the church of St.-Jacques-des-Guérets. Lots of changing light after the first hour, but I went with the initial bright overcast effect. Saturday is the end of independent activity for me: we pick up the rental van (at the grocery store! ), move into the chateau, pick up students at the train station in Vendôme, install them in the chateau, prep the evening's wine and cheese soirée, then sleep our way to Sunday when the work of the workshop begins. I did sneak in a couple small paintings though. Here is a small pic of a decorative urn at the Chateau de Courtanvaux in Bessé-sur-Braye. 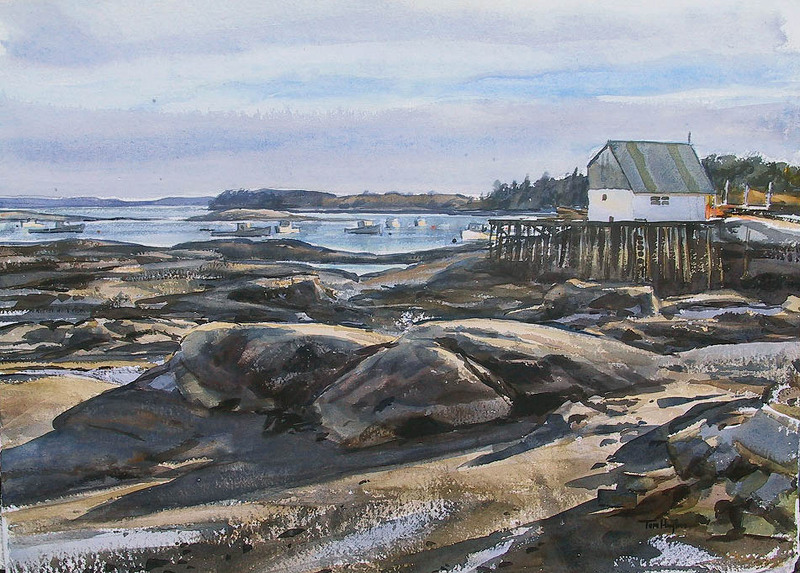 I am back from an extended trip to New England, and then to France; the former where I had my exhibition outlined in the last post, taught a plein air workshop through the Ogunquit Summer School of Art , and did a little painting for myself, the latter where I taught through Plein Air France Holidays, and again, did a little painting for myself. 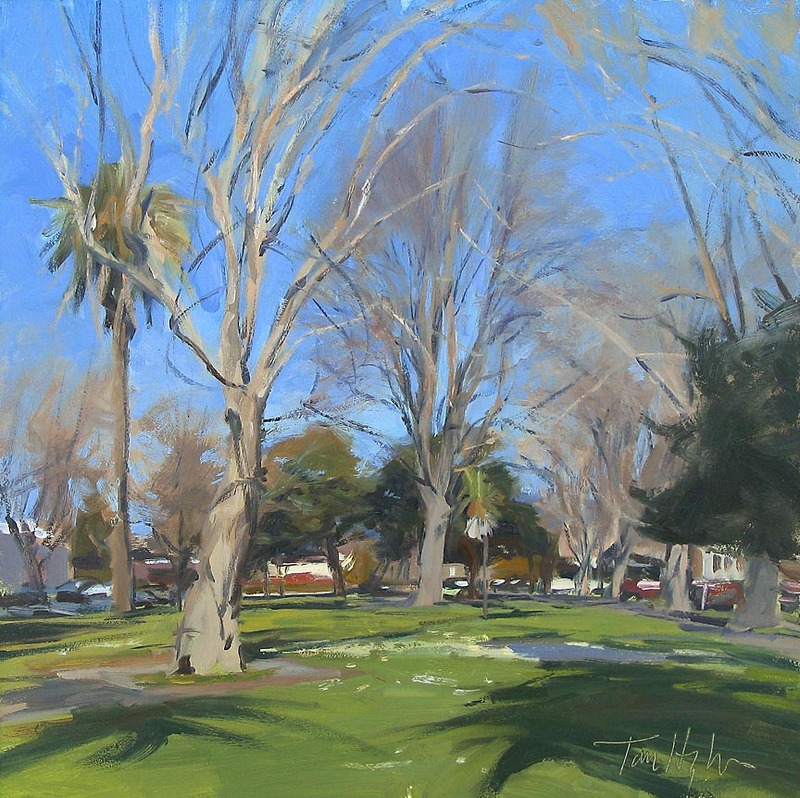 Thanks very much to Todd and Dave at the Todd Bonita Art Gallery for arranging the great opening and for your invaluable help during the workshop, and to Kate at Pleinairfrance! It's always difficult to get in as much painting as I'd like; between this and that circumstance, it was even more so this time around. 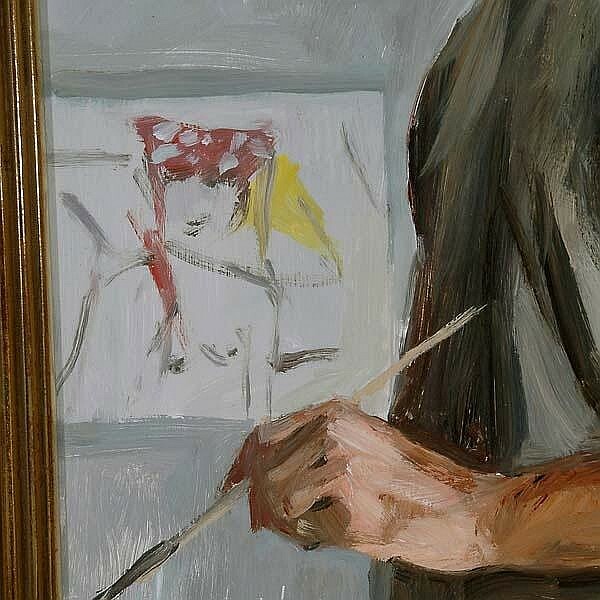 Still, there are a few new things to look at, all done alla prima. 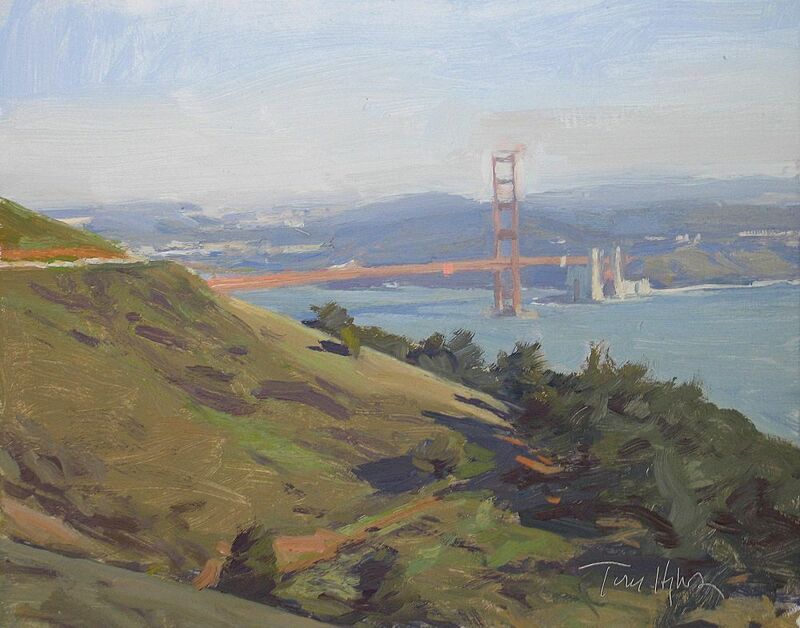 I went to paint the Golden Gate Bridge from the Marin Headlands last Friday and did two, one morning, one afternoon. 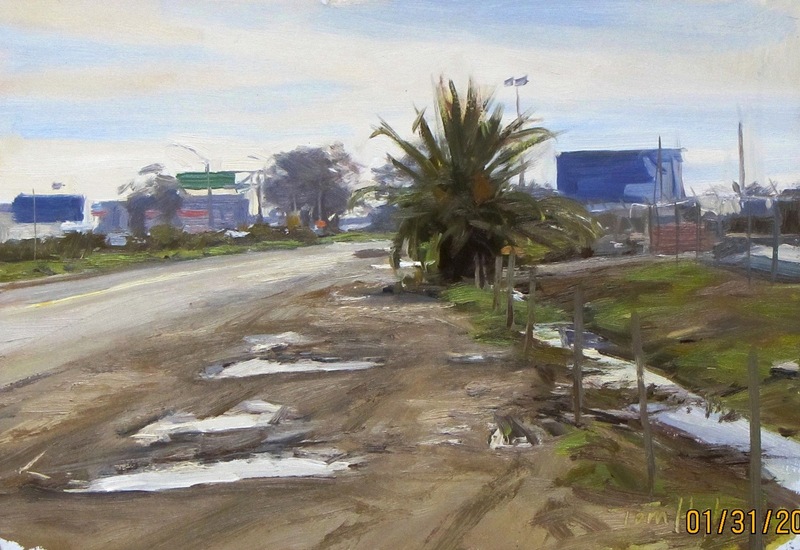 A few other recent plein air pics are these Oakland paintings, the first a spot on the frontage road that I drive past every day on my way to the studio. Note puddles; the highway department tarred over these potholes the day after I painted this, not that I'll run out of holes in the road to paint anytime soon. This one I did this past Sunday morning. Most of October was spent in New England. 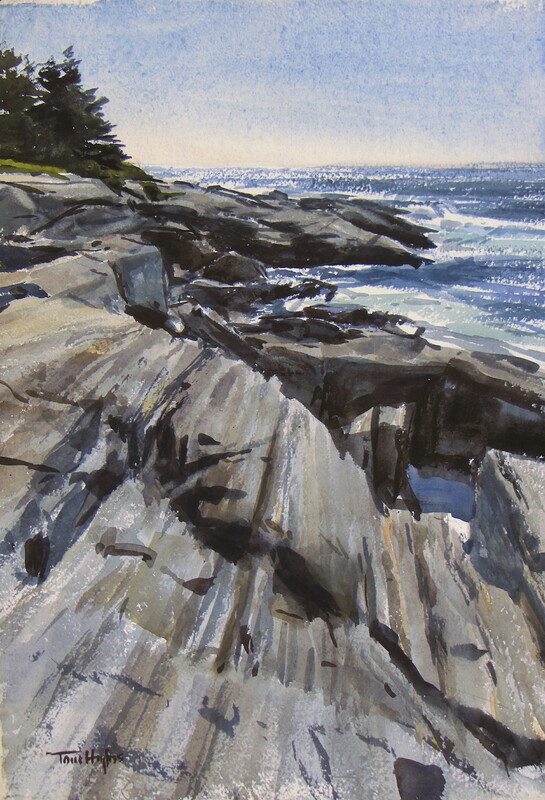 I taught a painting workshop in southern NH/ME - thanks again Todd Bonita and the Ogunquit Summer School of Art! - and then went to do family business in midcoast Maine. 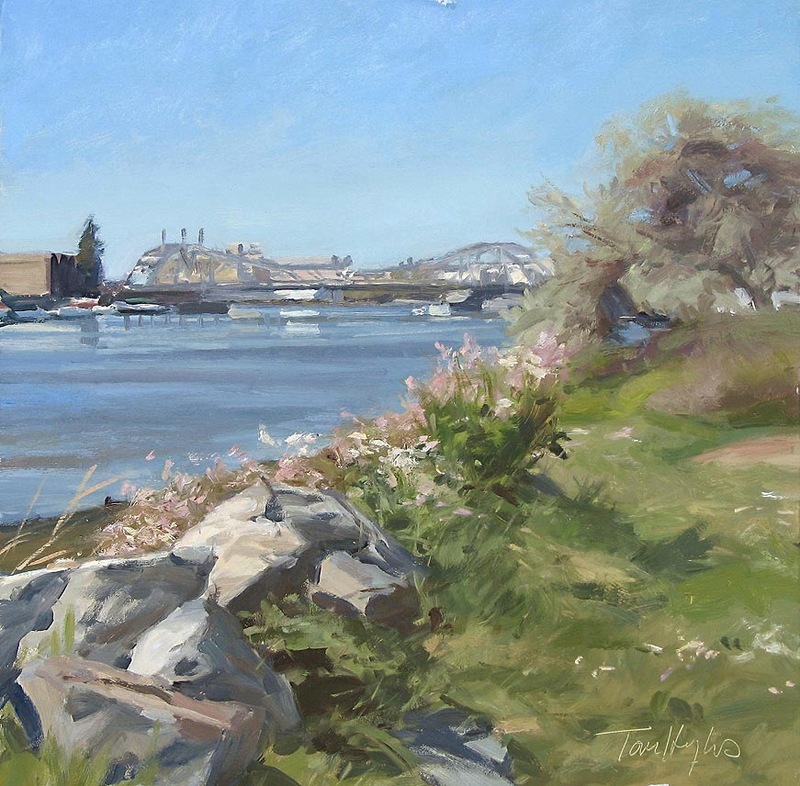 A few days painting there, most of the things I'm still working on, but here's one: an alla prima 14x11 done at Back Cove in New Harbor. 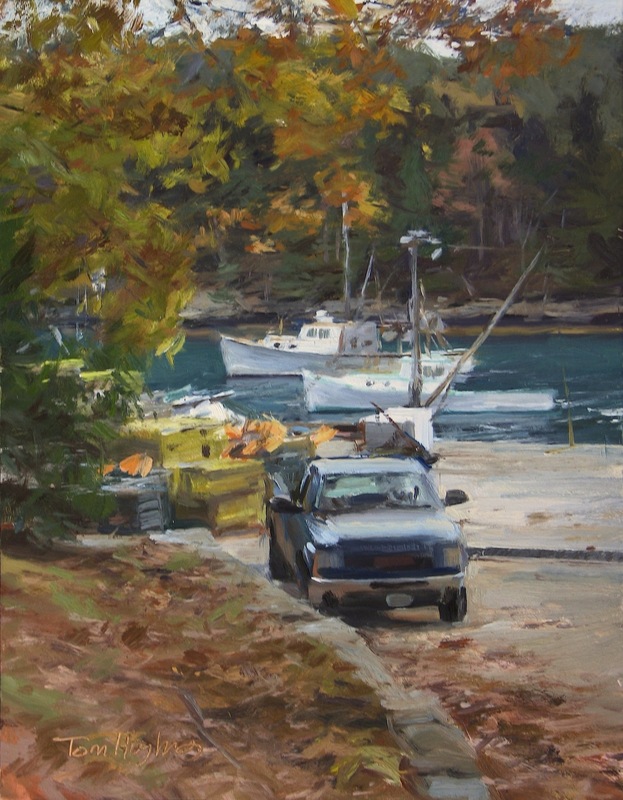 Met the owner of the pickup - and the hindmost boat - as he came in from a day of fishing and showed him the painting: "You never painted that, you took a picture! I just put $750 dollars into that truck - ball joints!" Here are three more paintings I did over the past two days. The first, a 16x20 inch panel, is a sort of front-lit view up rt. 44A (I did the little truck painting from the last post about 100 yards away on the same road); at least it started front-lit and graduated to a pretty flat lighting. I stood there 5 hours, start to finish, and it's surprising that things didn't change more than they did. The looming mountain is a local landmark, named Elk Mountain but more colorfully known as The Sleeping Giant. The same mountain is to be seen as the bluish hump in the background of the Elk River 2 painting in the Aug 11 post. The last two were done at the Fetcher Ranch in Clark, some few miles up the road from Steamboat. The whole PAPA group was there painting, along with area painters who had signed up to either paint or observe the visiting pros, asking questions, taking notes, etc. I managed to do two small paintings, rushing them over to the Steamboat Art Museum to frame and hang just before the exhibition opening at 5 pm. 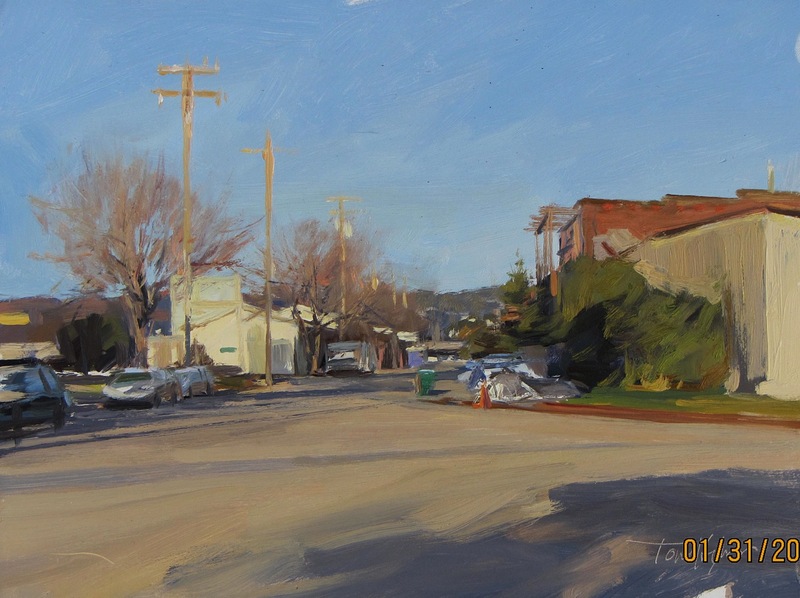 I'm leaving this morning, just as I got rolling, but I've got the Sonoma Plein Air festival in a couple weeks, so I should to be in practice for that. 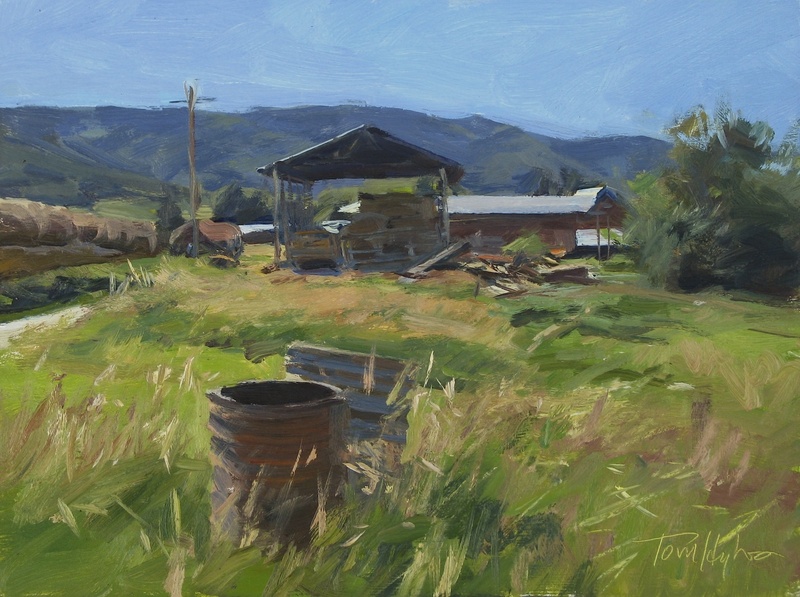 I was invited by the Plein Air Painters of America to be their guest artist at their Steamboat Springs, CO event this year, which is where I am now. 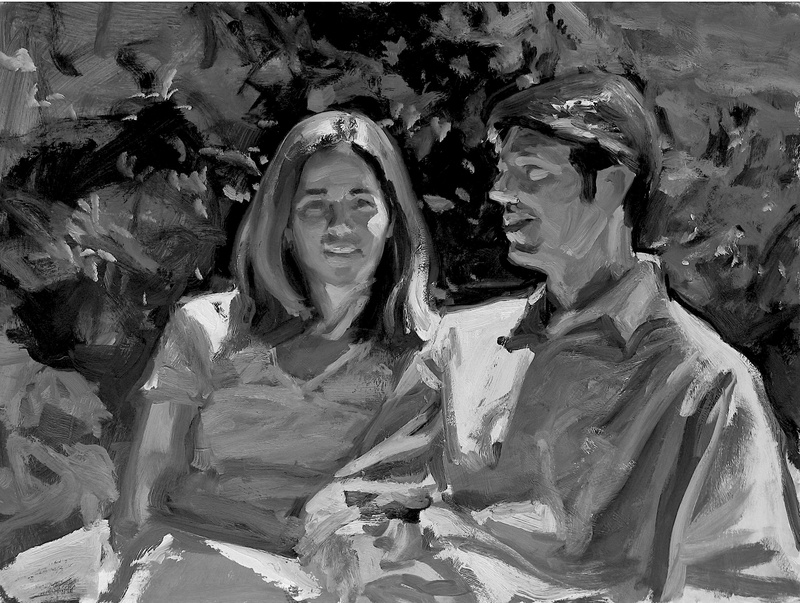 A couple dozen PAPA members, plus me and two other guest artists, are in the area painting for four or five days, after which there is an opening at the Steamboat Art Museum - the theme of the exhibition is the National Parks in celebration of the 100 year anniversary of the National Park Service, though there will be some of our local plein air work as well. Here are a few of the pictures I've done since I arrived here; more to come soon I hope. One of the acquaintances we made during our 2004 stay in Trôo was of Wil Smedts: painter, filmmaker, gardener, woodworker, ace conversationalist. 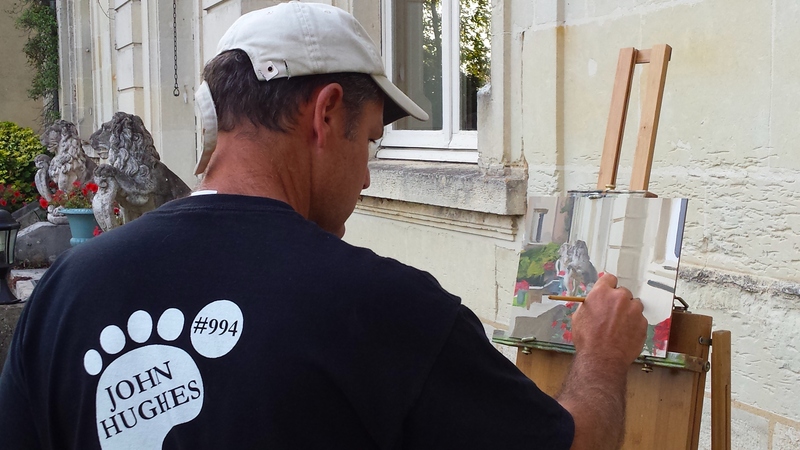 This trip, Charlene and I went one evening to dine with Wil and his partner Isabelle at their place in Les Roches L'Éveque, where I casually threw out that it would be fun to paint Wil's portrait. He pursed his lips and shook his head and I thought no more of it, until I showed up to paint in their garden a day later, and there was Wil, slathering acrylic gesso (who knows, it may have been latex house paint - Wil is a real bricoleur) on a very thin canvas with a sandpaper texture, mounted to his home-made stretchers; it was to be for his portrait if I was still up for it. The acrylic priming needed time to dry, so I set up to do a little garden pic, never finished, then we had a bit of lunch (in the garden). Time to see what I could do about a likeness. Wil looks very paintable, has a Keith Richards vibe. I thought he'd look good in a rakish sort of pose, sitting back with his little cigar, but he absolutely preferred to sit with his elbows on the little lunch table, looking down. I needed a bigger easel than the pochade box I was travelling with, so we fetched a studio easel out of the house (Isabelle is also a painter); I also prefer a hand-held palette for portraits, so we found a tiny oval one, crusted with old paint. It was all very impromptu, unprepared, uncomfortable, over-lit, ill-equipped: perfect. I thought I'd better hurry, not really trusting to Wil's - or to anybody's - readiness to sit for any length of time, and I had a comparatively immense canvas to cover; really only 34x29, but I'd been doing nothing but little pea-shooters since I'd got to France. Anyway, it worked out pretty well, all in about an hour, no kidding. I just blurped paint all over it and for once it worked nicely. I note the time elapsed both to impress and as a mitigating factor to the sketch's weaknesses. Wil is not a believer in painting from life or really any of the sort of thing I do as a serious kind of art, but this did tickle him. I trotted it out a few times to show Trôo locals: to a man they all said, "Wil!" 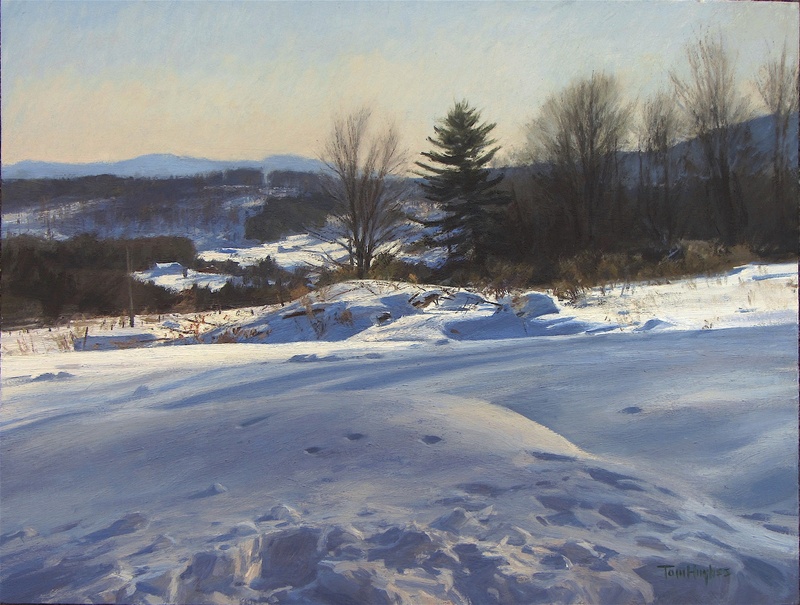 The cover story of the February issue of Fine Art Connoisseur is called "Great Collectors of Today's Realist Art." 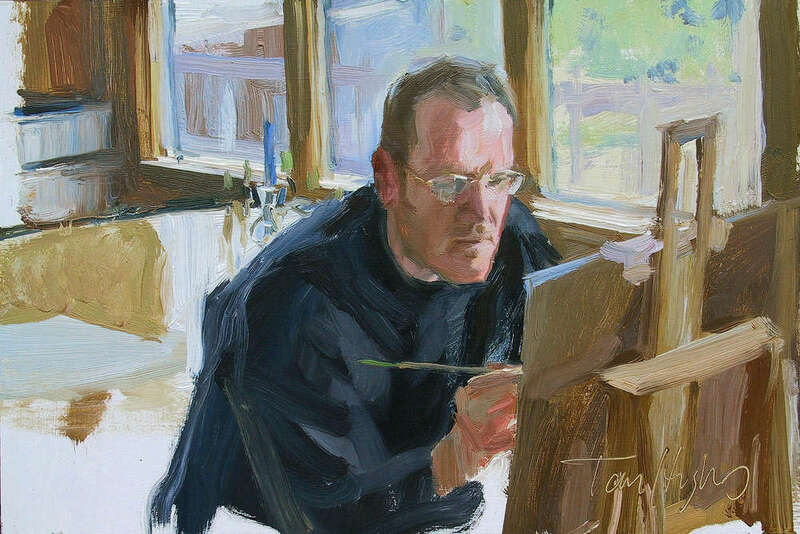 One of the titular collectors, Remak Ramsay, chose one of my paintings to represent the works in his collection - a collection that is comprised of 200 living artists as well as works by Sargent, Hassam, Chase, Bellows and more. I am really thrilled and grateful that Remak picked my work. 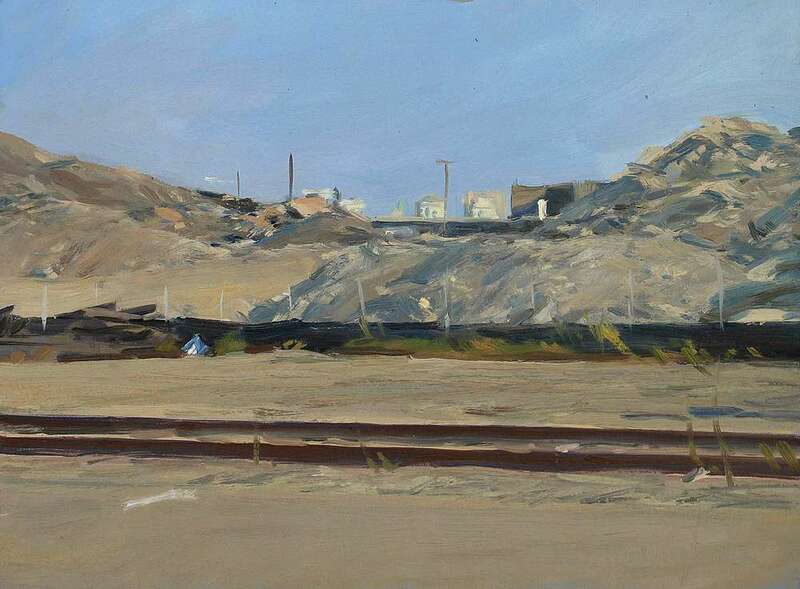 Scroll down to the January 14, 2009 post, skipping over the first installment of my blow-by-blow account of the big fog picture's progress, and you'll see the genesis of the painting below disguised as a paean to spring clamps. In 2009 I started it in SF and had to stop for a while. Started it up again in October 2011 at the Berkeley City Club as a kind of ongoing entertainment for the members. 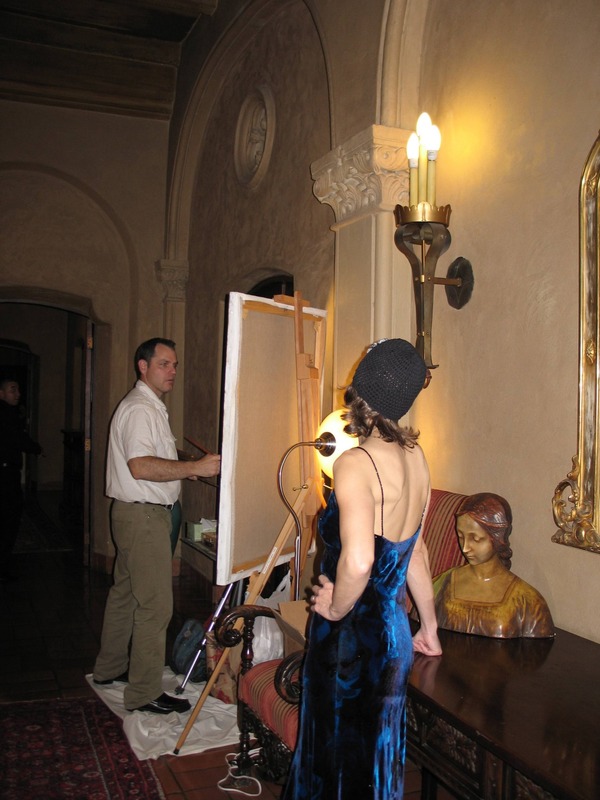 I had a notion of painting the picture in a dramatic/elegant/old-fashioned location and getting some attention from the club attendees, maybe the press - like those might be good things. I even thought I might write a magazine article on the process once completed. Red flag right there. I flubbed the press alerts, but I did have many many people walk by, some questioning, some commenting. Hindsight has shown me what foresight or even common sense did not - the difficulties I was inviting: poor light; little room to move; constant interruption; my tendency to indulge in loquacity when the topics of ME, PAINTING, MY PAINTING are broached, and in a related characteristic; reliance on an unreliable ability to pull out a decent painting in not-quite-ideal circumstances. I think we had 17(!) sessions. I never quite got the traction I need to carry through, and then a little before Christmas, my model Sandra said she was going away for the holiday, so I snapped a few pictures. Then the work started. I painted and repainted over the existing painting, squeezing what I could out of the pictures I took. I thought I'd finished it around the end of 2012 and brought it home to show Charlene. 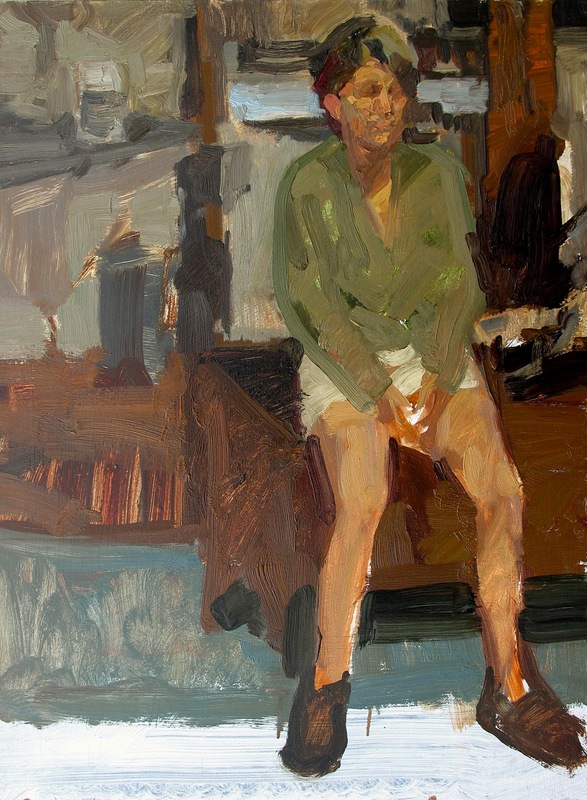 She pointed out a distractingly inconsistent treatment of modelling in some areas of the painting - which I'd wilfully ignored - so I brought it back to the studio and turned it against the wall for awhile. Until May or June this year. I turned it face forward and it was apparent, for once, what I had to do: another fairly complete redo of Sandra's shoulders, arms. Honestly, after all the redoing, what was another? Anyway, a redo always invites more redos, at least for me. So I redid the dress, why not? Let's redo the hand again, just because. Well, the redos are redone. I have not had it properly photographed, but here's my rough and ready jpeg. And, since I can't let it go yet, a couple photos taken by Charlene at the Berkeley City Club. 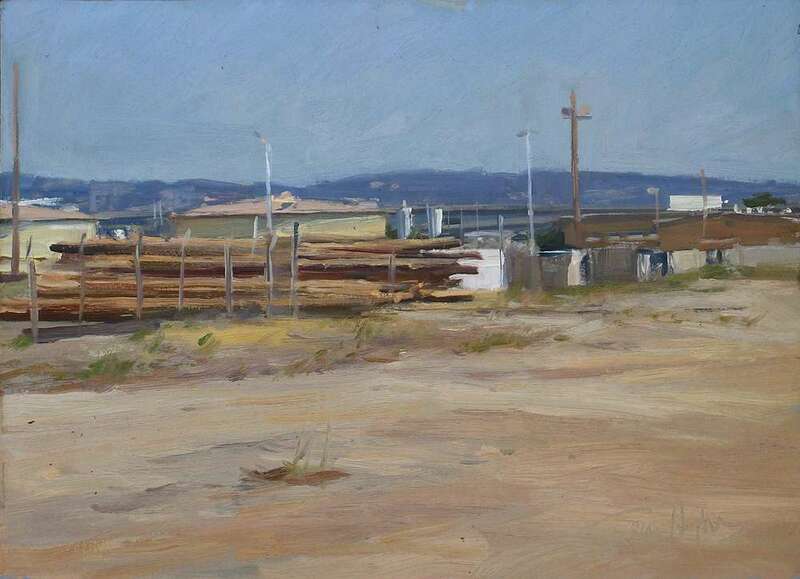 I went to the EBMUD plant in West Oakland a couple days ago - a lot of not much to paint, which suits me sometimes - and did these two: first the woodpile and then, turning 45 degrees, the heaps of rubble with the freeway and the Oakland twin federal towers in the distance. I had initially parked on the opposite side of the road, on the other side of the railroad tracks seen above, relishing the unnecessary use of my old Jeep's four wheel drive, but a man in fluorescent colors drove up and told me I couldn't park there: city property, liability concerns, etc, etc. "What about the other side of the road?" I asked, noting the EBMUD no parking signs every three feet: "Not my problem," he said. 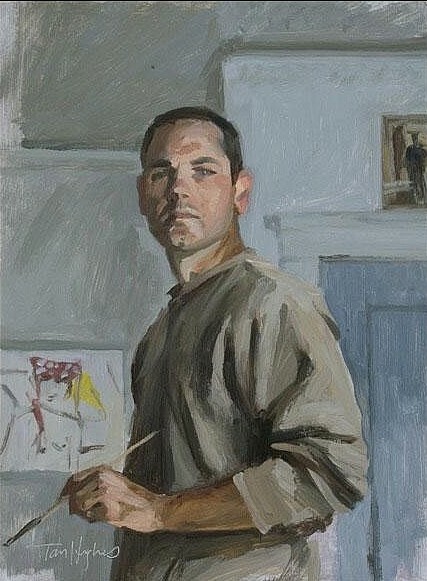 Ran across this, filed under "alla prima figure" on my hard drive - it's my brother Glenn painting, done a few years ago. 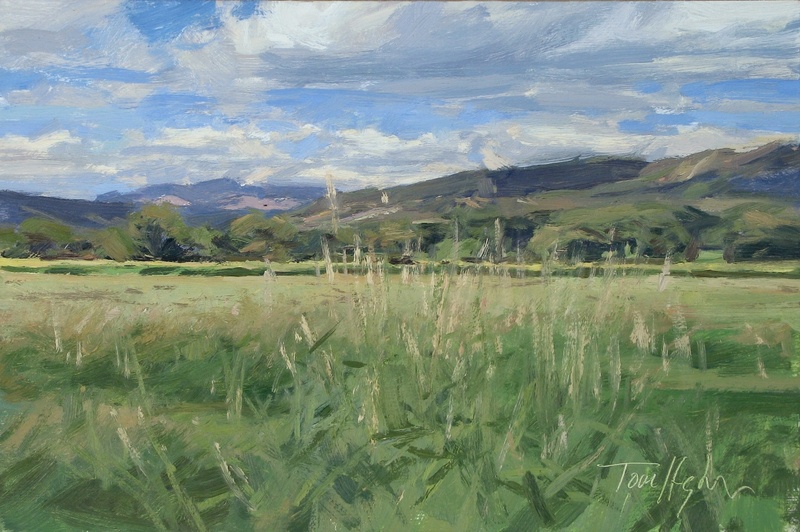 In my last post, I mentioned painting in Hope Valley a couple weeks ago. I brought a miscellany of sizes to work on, 12x16 up to 24x30. Here's the latter, finished in the studio. 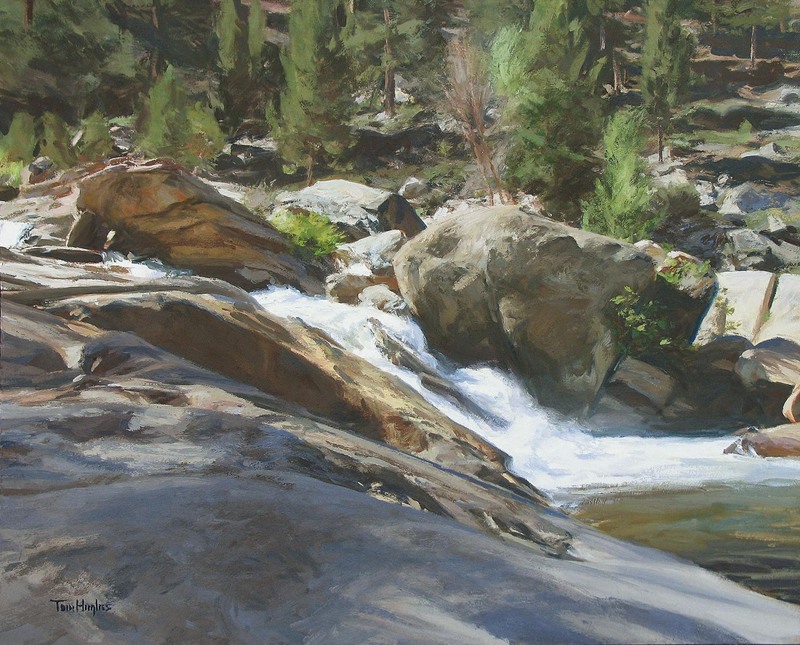 Two weeks ago, I went for a few days to paint in a favorite spot near Lake Tahoe called Hope Valley. Painted, ate, and slept. 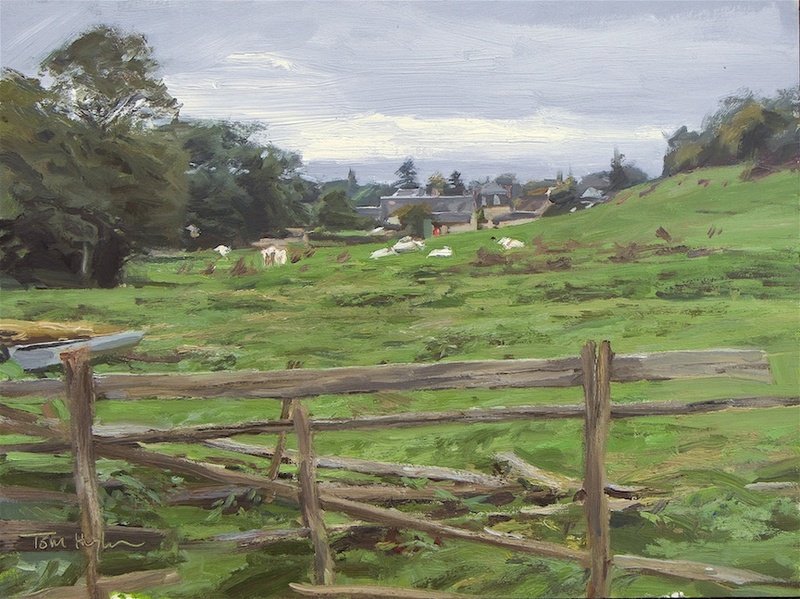 I was way out of practice with that sort of landscape, and worked flat out for 3 days before I felt like I had a clue. Made 9 starts, one of which went right into the motel trash bin, but none finished - ugh - (am closing in on a couple in the studio, to be posted here upon completion). 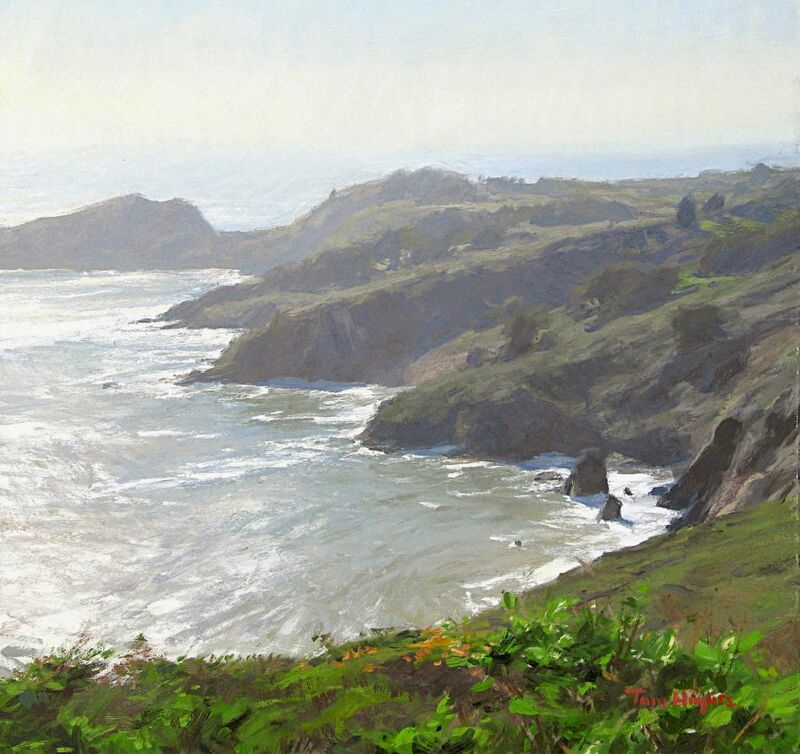 So I was pleased to scratch my name into the picture below, done at the Marin headlands yesterday, from Fort Rathbone/McIndoe: rather than doing a big view like last time (February 18 post), I did this one, looking downward. I had actually set my easel to do the big view, even with a real churning fog partly obscuring it. But once the whole thing was blotted out I turned to face the other way, looking at something a little closer (if you looked up from the picture plane and could see through the billowing fog, you'd see the Golden Gate Bridge). Once I got well into this one, the fog - of course - dissipated. The hours passed and whatever contrast there was at the start flattened right out. 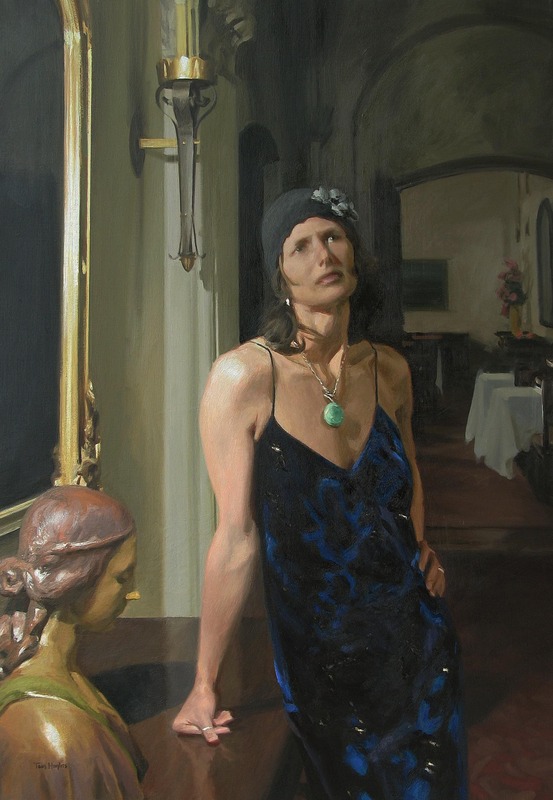 I like doing that sort of thing - close values all over the place - but it is more difficult, generally speaking, to know if you're on the right track without substantially proportioned light and dark areas; there is also less ready-made pictorial drama. Anyway, it was a workout, as usual. Here's a painting that I started while scouting for my upcoming workshop: I put in two hours at the location and then finished it in the studio. If I have four or five hours on the spot with something of this size and light that I can go with, I can bring it around to signability often enough. This time though, I misjudged where the sun was going to go, didn't have a cap with a visor - silly oversight - and had I stayed to finish would have ended up with smoking holes where my eyes used to be, so I decided to move on to something else - the Valentine's Day entry below, as it happens - before it got dark. End of the day quickie done while scouting the workshop locations. 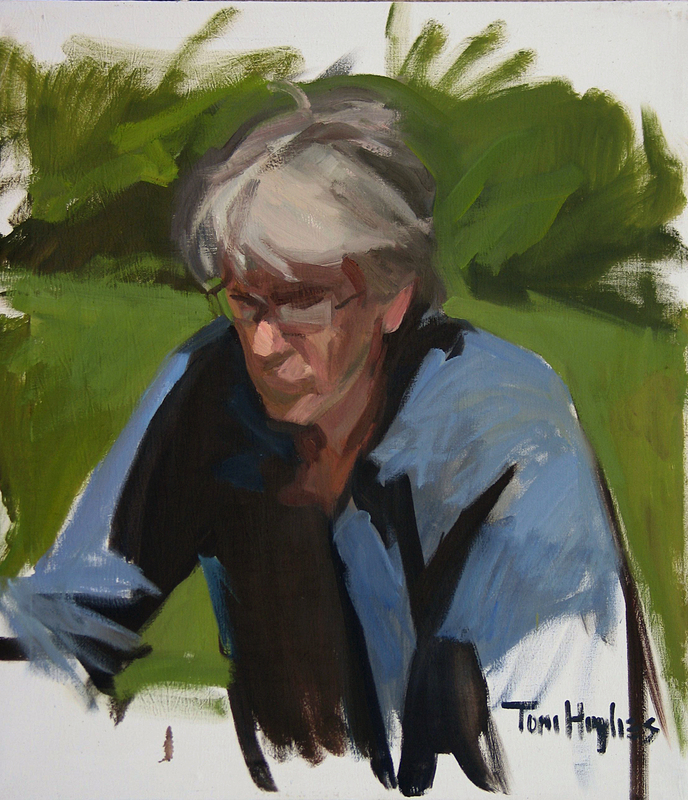 I did a quick demonstration painting last week, the point of which was use of a limited palette. I came nowhere near exploiting the chromatic possibilities of the few colors I had (white, ochre, vermilion, black - the old Zorn palette mentioned elsewhere in this blog), mostly because the subject already looked like a Zurbaran, so I went with it. 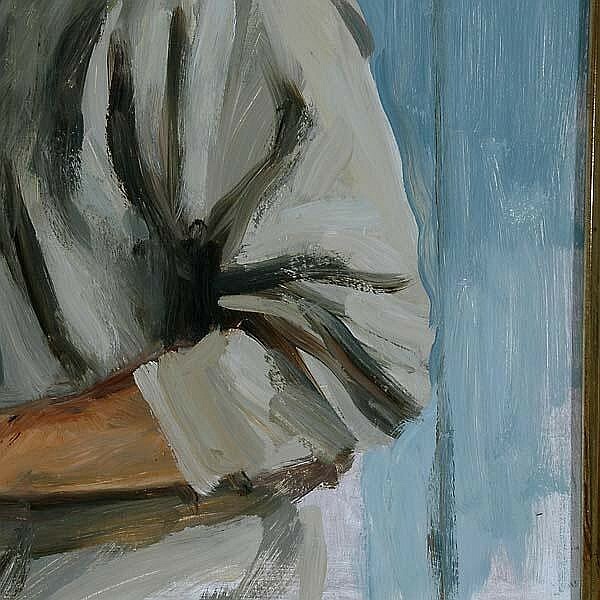 I am fascinated by the - to me - beauty to be found by working within specific constraints; beauty encompassing the experience of actively figuring out how to use two of the colors, red and ochre for instance, to induce a mixture of white and black to look blue. The potentials of these few colors are revealed when they aren't surrounded by a dozen other more saturated paints: you'll only see what I mean by taking the time to mix three or four values each of the basic palette, then cross mix them - the black with ochre then with red, the red with ochre then with black, through each of the values, light to dark: lovely pearlescent semi-violets, an almost-green, a mellow orange. Beauty also encompasses what for me is a more "creative" or maybe abstracted experience of painting, who am a fairly decent recorder of the colors and values I see but not an imaginative composer and orchestrator of color like, say, Bonnard. Walter Sickert pointed out that whether a man makes a thing red or blue is settled in the cradle: most painters who have thought about it at all, vis a vis their own default settings, would agree that the same applies to a tendency to compose in tone versus color, paint big versus small, etc. Maybe I'm just what they call a tonal painter and that's that. It looks like a lot more color. 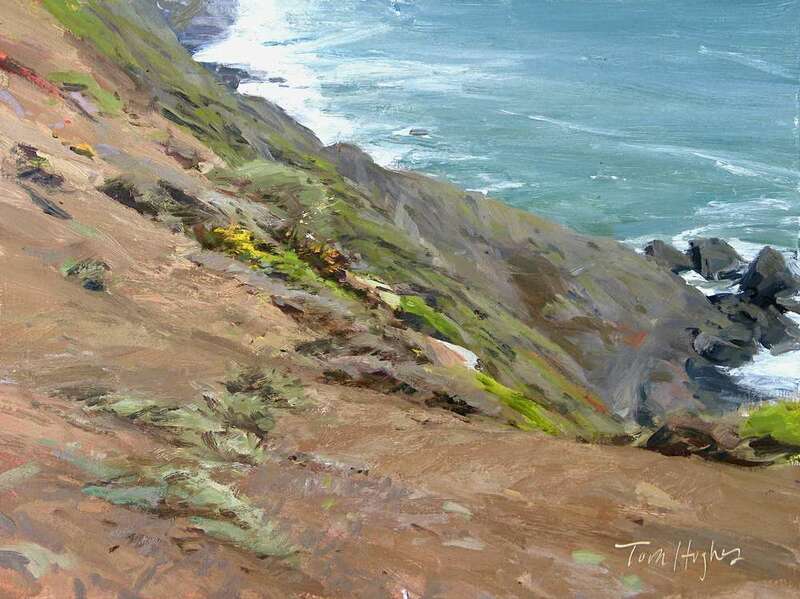 I'd say it was more colors: I did this from life in the California sun, my usual palette of a couple yellows, a couple reds, a couple blues, some earth colors, and plenty of what looks like exuberance of handling, a by-product of racing the light. Still tonal in structure though, that's how I roll. This was going to be a quick portrait of my cousin Jenny, begun long ago in New Hampshire. I remember being frustrated by the slickness of the board I was painting on, I was piling greasy paint onto the face to try to get something to happen, also that we had to call it quits after a very short time. Looks ok to me now. 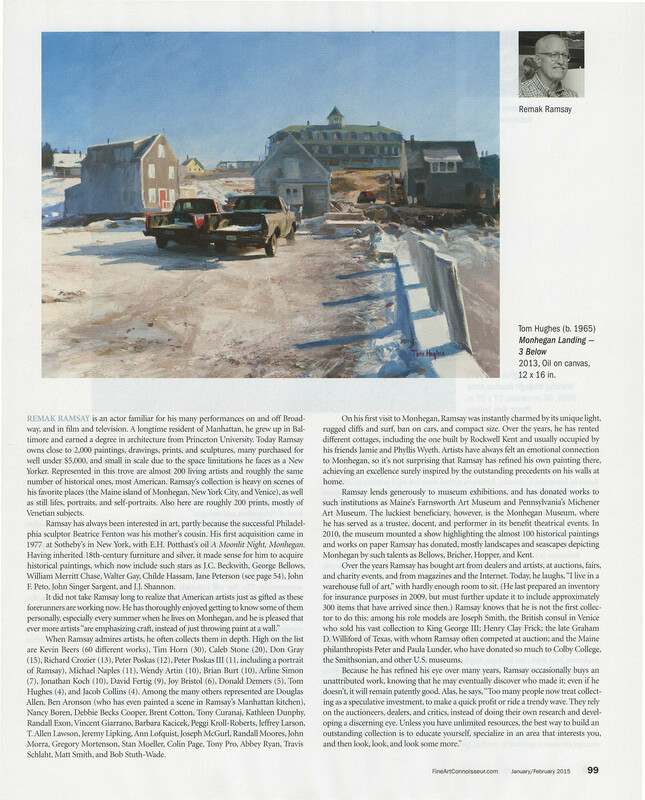 In stores as of yesterday, Watercolor Painting by Tom Hoffmann (Watson-Guptill) features one of my Stonington pictures, done while standing in the sun on a broad flat rock - my brother painting oils - in the fall of 2005. It's a good book. 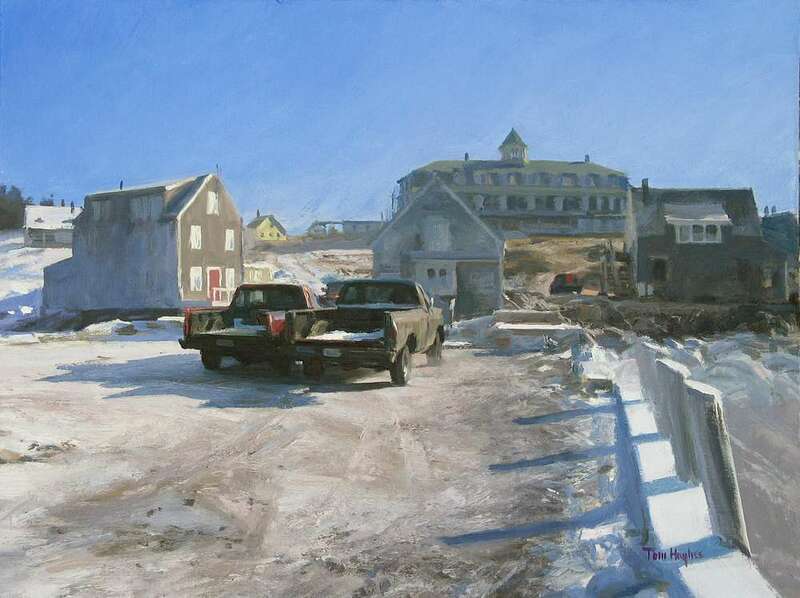 Instead of going over all the how-to-book tropes (how to paint a gradated wash, how not to make muddy color, how to make watercolor behave/misbehave, etc), Tom Hoffmann does a very neat job of encouraging the painter to adopt an unrushed and aware state of mind, a kind of third-person stance to his/her work in the moment - he's right on about this. My blurb here might make it sound like one of those (to me) grating zen-of-, tao-of- books, but it isn't; there's plenty of practical material covered from a different than usual perspective, especially related to the chess-playing aspects of watercolor; thinking in layers, thinking several steps ahead, etc. 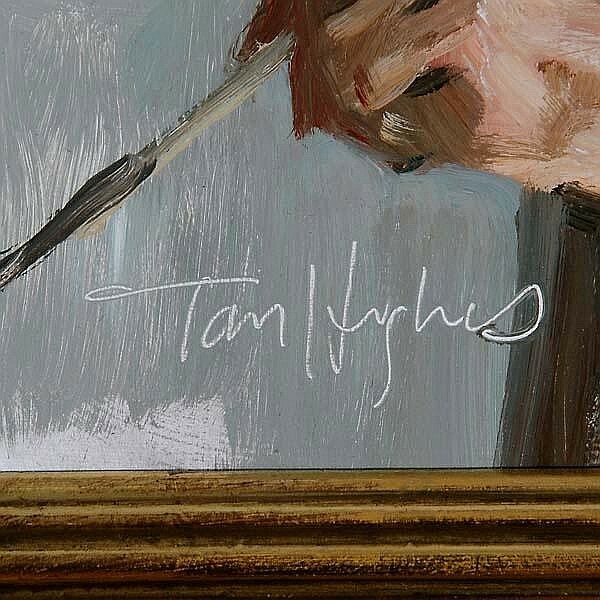 This isn't a plug btw, it's an unusually good book about painting in watercolor. Aside from many examples of Hoffmann's own work, there are paintings by Trevor Chamberlain, John Yardley, Ogden Pleissner, other biggies. 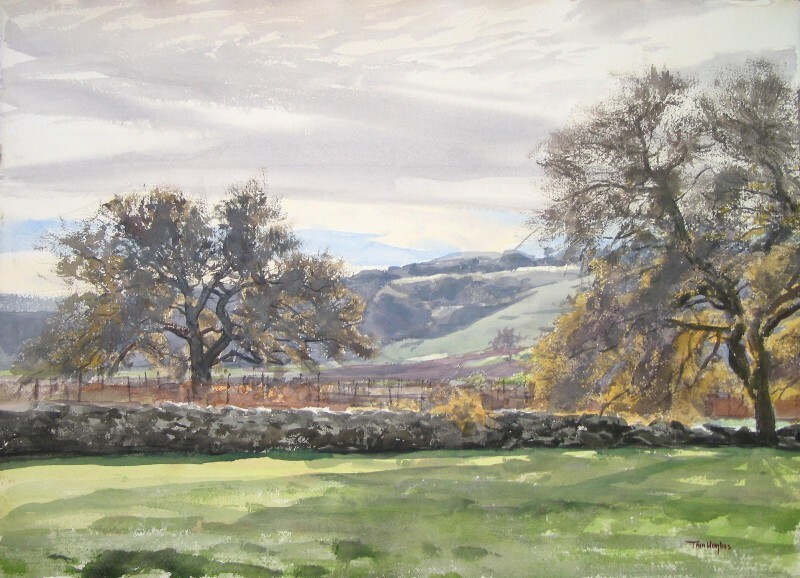 This painting and next were done from the same spot on succeeding days; one facing northwest, the other southeast. The bridge in this one is the High Street ridge, which connects Alameda on the left to Oakland on the right. 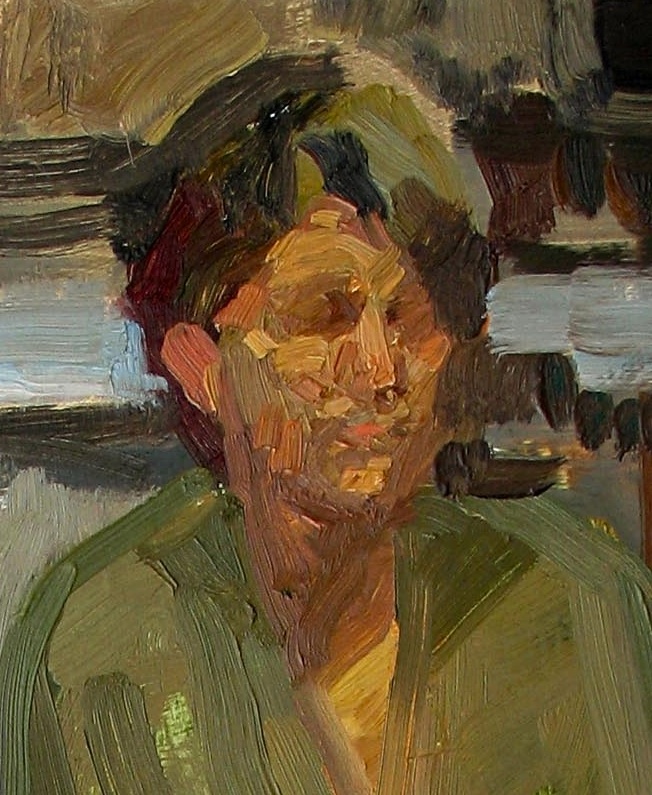 It's notable that for such a green painting I used no green pigments; all blues and yellows, reds or browns. I typically have one green on the palette for outdoor painting but it's just for convenience unless a particularly pure, bright note is required. The convenience color is really tempting to reach for: you see something greenish, you think "green" and automatically run a brush into it, then modify it with other colors, but it's instructive to have to come up with all the variations without actually using something labelled "green." Personally, I'm at once motivated by the dual impulses to puritanically cut my palette down to a minimum of colors and alternately to deploy a wide variety of them thinking it would be fun to see what happens when I mix, say, cobalt turquoise with naphthol red. 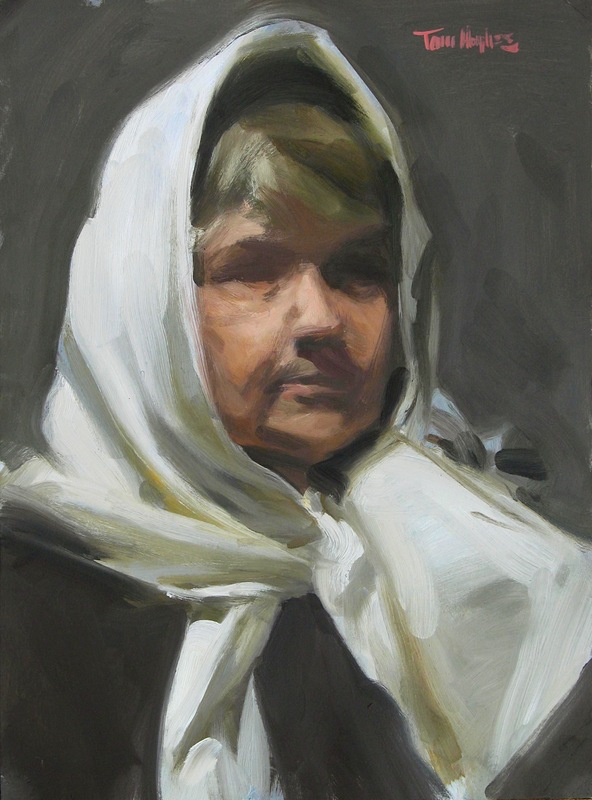 Being a more or less tonal painter, I just about always end up in the same place; I also derive an unsophisticated satisfaction from getting the painting to look like the subject, at least when I'm working from life. In retrospect, the touchy dry-brush work in the densely twigged oaks makes the rest of the painting seem like it must have been child's play by contrast, but unless you're in the zone from the beginning, the whole thing seems terribly contingent right up until you sign it. Even then: Don't flub the signature, it's watercolor! 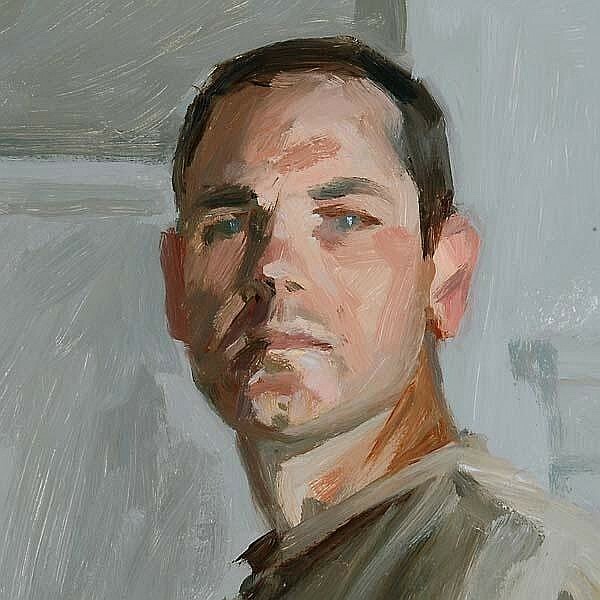 Something even a genius like Sargent referred to as "making the best of an emergency." I'm not so frugal about the number of colors I squeeze out for watercolor. There are typically 18-20 versus 4-12 with oil. The real workhorses are ultramarine blue and whatever complementary color I mix it with for the neutrals, but the independent beauties of some of the pigments show to greater effect in watercolor than oil or acrylic (at least in the way I use them) so that cerulean blue (the genuine stuff, cobalt stannate; PB35), for instance - a really delightful semi-transparent, granulating sky blue - is a staple in the former medium and a costly rarity in the latter two. 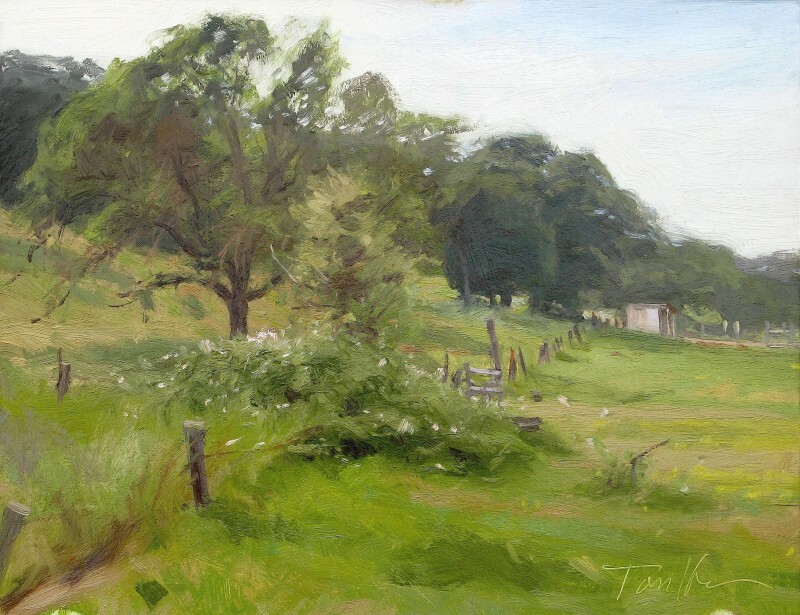 Decades ago, when I started to paint outdoors, I found that specific things gave me real trouble - in addition to the baseline trouble that everything entails - and I would paint in places or at times in which I could work on those things. One of them was skies. Another was what I call - excuse the professional jargon please - sticks: the masses and jumbled filigree of branches, twigs, brambles, etc that are everywhere in New England from autumn into spring. 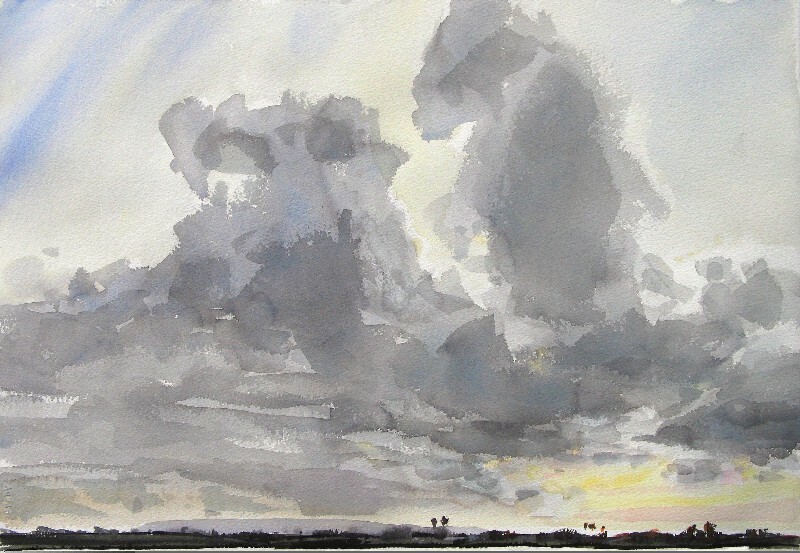 But whereas it's tough to make much out of a stick-painting, sky-paintings are another matter. Living in the SF bay area has put me seriously out of practice though; not much paintable happens in the sky here. It's usually either cobalt straight from the tube, or gray, or a sort of ripply gray. 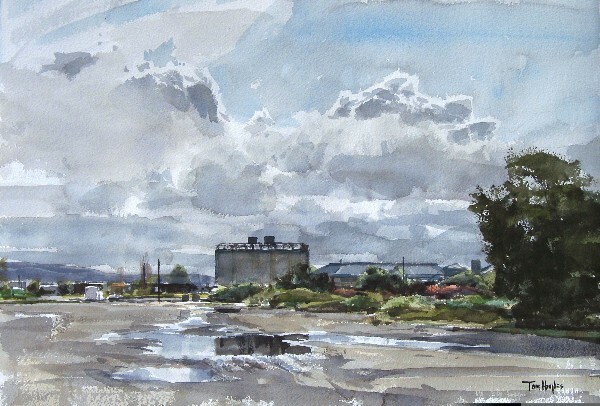 A week or two ago we had skies for a while and in between rain storms I went out to do watercolors. A day later I went out and couldn't seem to do anything but clunkers. The sun was going down, sky was sort of weird, but I hadn't cleaned up yet, so I figured I'd give it a go on the flipside of the day's first mess. This was really quick for me, done with one brush, a one-and-a-half-inch sable flat. 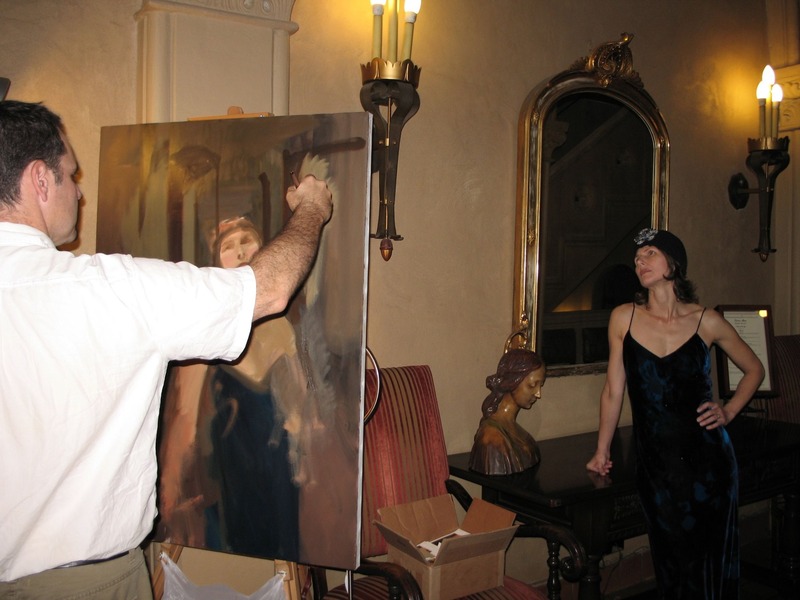 Here I am doing a portrait demonstration in Danville last week. Look to the right of the picture; there's a self-portrait I did earlier that day. I thought that I might be out of "practice" and better get my hand back in, but I'm pretty sure I did it out of token conscientiousness: I don't have what you might call an encapsulable step-by-step method, full of rules-of-thumb like picturing the head as an agglomeration of geometric objects, or dividing the face into three strips, or "the nose and cheeks are warm, the forehead and chin cool", etc, etc. Sometimes you can come out of months' hibernation and do the greatest thing you've ever done, just as you can always have a bum day, no matter how much you work; and I wanted to have something fresh and rapidly-done to show to the audience, or maybe to myself. I dislike wearing glasses when I work, but I like painting them. I used a pretty limited palette: white, ochre, vermilion, black, ultramarine. Take away the ultramarine and many painters will recognize this as the Zorn palette, after Anders Zorn (Swedish, 1860-1920). I don't think he was unusual in his frequent use of such a limited palette but he was unusual in his total mastery of its possibilities. Anyway, I tried to do this thing quickly but without rushing, if that makes sense. 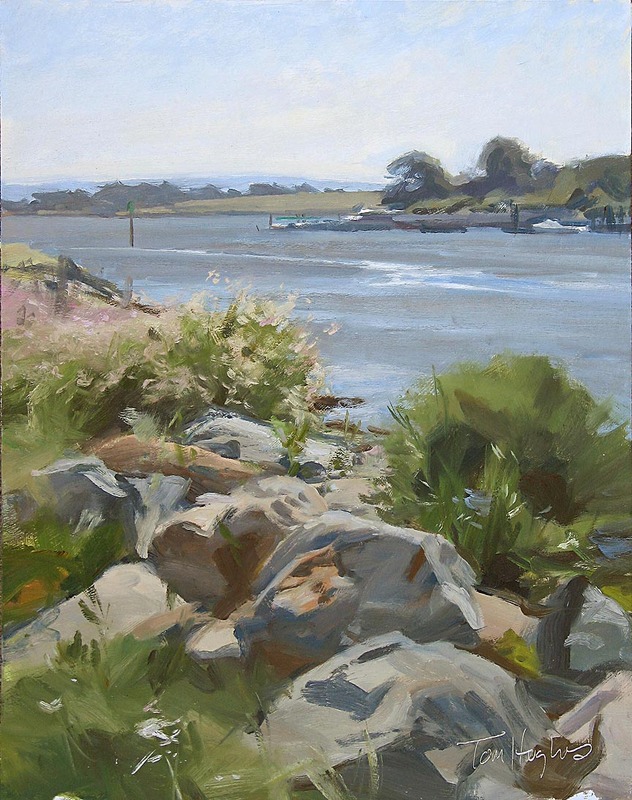 I interrupt my last progress report with a newer, unrelated progress report: I decided to put aside the Ashuelot acrylic for a while and do the sensible thing; a 4x6 foot oil from a quick half-sheet watercolor, but with completely different light conditions. No-brainer, right? Here's the sequence so far, starting with the watercolor. First shot, lots of canvas to cover. The arrows point to what you can't have too many of: clamps. Clamps do for painting what tape does for the rest of the world. Note old-school single-post easel; great design - as long as you have clamps.